Yesterday evening I waited with anticipation for Nintendo's big Switch announcement (starting from 10pm UK time). Ahead of the event Nintendo has teased a "new interactive experience" for Nintendo Switch "specially crafted for kids and those who are kids at heart". Now, all has been revealed; Nintendo has launched some 'Toy-Con' cardboard creations which allow you to play with your Switch "in entirely new ways". The Nintendo Labo asks users to 'make - play - discover'. Early examples of Labo projects put forward include fishing rods, pianos, robots, motorbikes and more. Kids and creatives will enjoy adding stickers and even painting their cardboard creations to bring them to life. Accompanying the cardboard origami sets are specially made Switch apps - the key magic ingredient to make Labo 'magic' and fun. If you look at the embedded video, and it's worth it to see Nintendo's vision more clearly, you can see some fun looking projects. There are at least two musical applications but probably the most compelling looking creation is the Robot Kit and accompanying game / experience. Twice in the promo video Nintendo shows someone wearing a string and pulley backpack system and screen visor rampaging around a virtual world smashing up buildings. Other applications use a fishing rod style construction, and there's a motorbike handlebars construction with an accompanying racing game. If successful we can expect more kits in coming months. I did spot more creations in the video than available within the two initial kits. 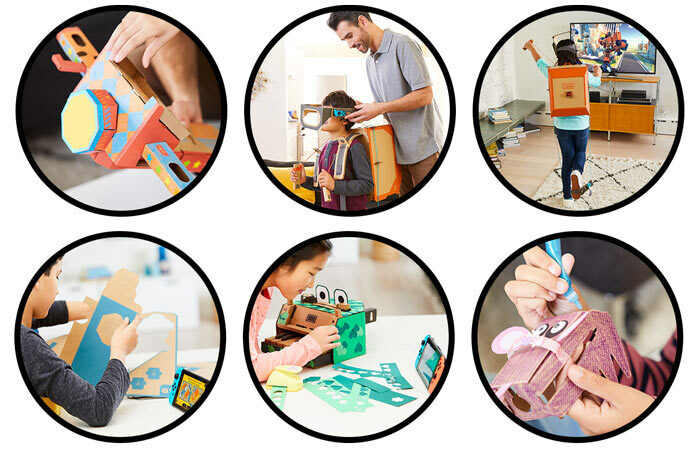 If you are interested in the above, there are Nintendo Labo Workshop events in London from 14th - 17th Feb, and in San Francisco (2nd - 4th March) and New York (2nd - 3rd Feb) too. Shortly after (20th April in US, and 27th April in the UK) Nintendo will start to make the variety kit ($70) and the Robo kit ($80) available to buy. It does Look totally gimmicky but How cool does the robot look!! I think the switch is my favourite console I've used.